That picture up top (which I created from scratch on my own by the way, with a few influences from other sites), is a typical representation of a Virtual Private Network (VPN). Companies very commonly have a VPN for their company network to make sure some semblance of confidentiality and privacy are maintained. So what is VPN? Have any of you guys watched the early 70s show Hogan’s Heroes? Its a show about a group of allied soldiers in a German Prisoner of War (POW) camp who are there by choice. They have a massive underground operation to sneak plans in and out of the camp and bring other allied pilots shot down in and out of the camp while arranging for them to be rescued. The leader of the group, Col. Robert E. Hogan, and his band of misfits regularly exit and renter the camp through a series of tunnels which have been built from the outside into the camp, which are so expertly hidden, secured and fortified that only the ones who built them, know anything about them and accessing them. So now think of your company as the POW camp and you and your other colleagues are Col. Hogan and his team. You guys need to get in and out of the camp so you create tunnels from the outside to the camp. These tunnels bypass any of the fences and walls that keep folks out of the POW camp and keep camp activities from being seen by people on the outside. The tunnels become an extension of the POW camp grounds. So when you create a VPN connection to your company, what you’re essentially doing, is creating a secure tunnel that extends the company network to where ever you are. So long as the connection is active, its like you are virtually in the company network, even though you’re no where in the company. You have access to company resources, files, servers, etc which you wouldn’t have access to once you plug your laptop out of the ethernet connection at your office. Most folks think VPNs only protects confidentiality and privacy, but on top of that, there is networking aspect which is often ignored. Lets touch on that network aspect first. As you may or may not know, the current implementation of IP addresses (aaa.bbb.ccc.ddd), IPv4 is fast running out, so you can’t issue a public IP address to every single network entity you have. You want to save the public IPs for resources that should be accessed by the general public, for example, your website or your public FTP server and use private IP ranges (eg: 192.168.x.x, 172.28.x.x, 10.0.x.x) for all the other devices. In some cases, where one only has a single public IP (there are companies like this, trust me, I know), what is done is to use Network Address Translation (NAT) to map several private IP addresses to that one public IP. This is called One-to-Many NAT. Having a VPN allows you have private IPs for your company resources that don’t need to be public, but still allow employees outside the company walls (eg: overseas on official visits, on holiday, etc), access to those resources. It also allows for one to bypass firewalls in certain counties – China for example, where access to Google and Google services has been completely cut, companies who have switched their company email to Google Apps email, have no access until they activate their VPN. Doing so, their internet traffic is routed back through their company network and then to Google, rather than through whichever ISP in China they are connected to in which case traffic gets blocked. I recently explained this concept to a friend who was in China and who couldn’t for the life of him get his emails and he very predictably responded “Oh, but I though VPN is for security?” – yes it is for security, but as explained, not only security. Speaking of which, lets get to the security aspect of VPNs. 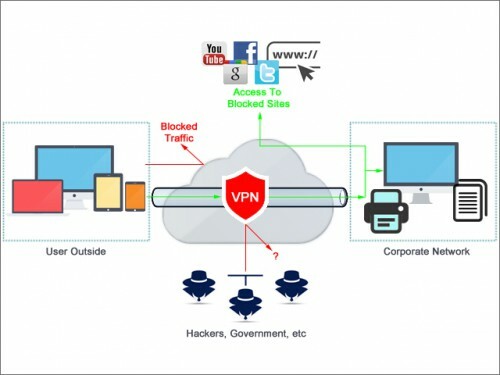 Looking at most implementations, you’ll find at least two prominent types of VPN connections, PPTP and L2TP/IPSec and folks have been using them for years, blissfully ignorant of just how secure they really are – afterall, if the company swears by it, then it must be good right? Wrong. Since the Snowden reveal, there’s been a lot said about just how secure security is, especially since government agencies have been chipping away at the integrity of the protocols used for decades allowing them to read in transit what is supposed to be unreadable. There are several reviews on the types of VPN available these days and just how secure they are (BestVPN has a good article, though there are some inconsistencies, but none the less its a good read). I won’t reiterate whats in the article or dozens of other articles, but the long and short of it is, PPTP and L2TP/IPSec isn’t as secure as its supposed to be. If you want to use L2TP/IPSec, consider using the Internet Key Exchange v2 (IKEv2) IPSec tunneling protocol. Its offers a lot more security than your standard IPSec. Setting this up on Ubuntu is typically a matter of installing StrongSWAN over LibreSWAN (see here). Of course you could also spend a couple of thousands and get a commercial, dedicated VPN appliance, but unless you’re running your own business and have lots of corporate secrets worth millions and millions, I don’t figure its a practical idea (if you had millions, you wouldn’t be on my site anyways). However if you’re a typical home user that just wants simple security of non critical data or basic access to your home network from outside, you now have my take on VPNs. You want to set one up, make sure you know what your needs are. Don’t go tearing your hair out trying to implement OpenVPN or IKEv2 when all you need is access to your home network from outside – PPTP is all you need and you can have that up and running in under 5 minutes. For a security concerns, as long as you don’t intend to go to battle with certain governments, the default L2TP/IPSec implementations are find (also easily setup in under 5 minutes). As with everything else, know what your goals are before you implement anything.